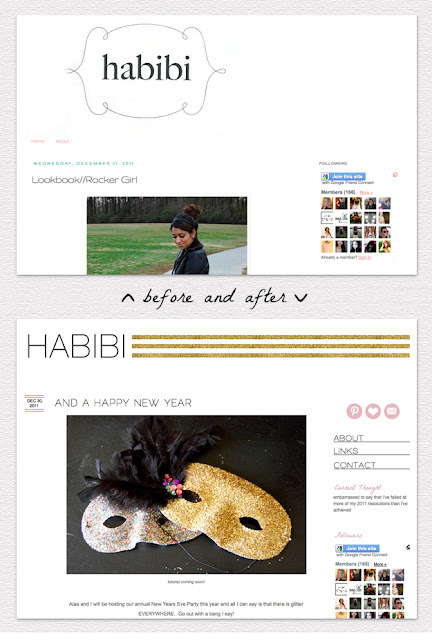 Welcome to the new and improved edition of "Habibi"! I am so excited to start the new year with a new look- and it's all thanks to the wonderfully creative, talented, and SWEET Jessica of Creative Index. The girl does wonders I tell ya. And now, I'm lucky enough to call her a good friend. Here's a little before and after for you. Want to give your own blog a face-lift? Jessica is definitely your gal! Check out her blog design promotions here. it looks unreal. Jess is SO good! Looks fantastic!! I love it. Now I really want to redesign my blog.. that's on my 2012 "To-Do" list.